We here have received iPhone cases by the truckload it would seem over the years. Yes, cases, come in many sizes, shapes, designs, textures, and features. However, this would be the first time we've come across an iPhone case that their feature is interactive. Well, kind of interactive. These are the new "Retro Game" cases from PureGear with the little mini game on the back. Perfect for when your games on the iPhone aren't quite entertaining enough. As far as cases go, they're pretty standard fare. They don't add much bulk, are made from a hard shell plastic, and fit and iPhone 5 snuggly, offering up minor protection, but not full-blown military grade shock or shatter proofing. These are, as they say, pretty run-of-the mill cases. What sets them apart, is when you flip over the case. Rather than a cool design, or a tactile fabric, these include a maze, or even one with a small pinball game in it. It's reminiscent of games you may find in a cracker jack box, or perhaps take home from a childs birthday party goodie bag. It's really more gimmicky, and one could even say ironic that one may want a case like this. Perhaps some would cling to the nostalgia, or irony they would provide. 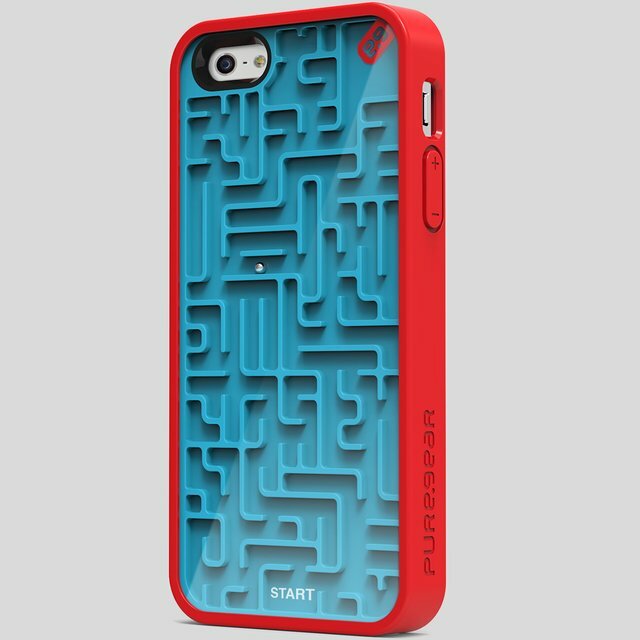 Again, cases come in all colors and patterns, and fabrics, etc, so we shouldn't really look at anything beyond the maze game as anything more than just a unique design, and with a myriad of cases out there - I kinda like these for their simpleness. The collection comes in three varieties, with apt names: There's the "Amazing" which is of course, the aforementioned Maze game. The "Groovy" which requires you to navigate three silver marbles into the center of the maze to win. And the "Undecided" which is a simple version of a magic 8-ball. Pull back the plunger to send the marble up and let it decide your day-to-day decisions. Each available for an MSRP of $29.99.